seed cycling for hormone balance | To Health With That! Seed Cycling and Pregnancy Before, During and After. Seed cycling is a gentle way to re-establish normal hormonal rhythms for women, but many people have questions about what to do around seed cycling and pregnancy. If you’re unfamiliar with the idea of seed cycling you can read about the basics here and I’ll add a visual how-to before we get started. Here are some thoughts. Seed Cycling for hormone balance adds seeds into your diet following the rhythm of your body or the moon. Seed cycling and pregnancy are a natural fit. Naturally anything that helps to normalize your cycle will ultimately boost fertility so seed cycling and pregnancy go hand-in-hand. In preparing for pregnancy your body is trying to create a soft landing space for a fertilized egg, a cushy spot to settle down and take nourishment. That cushy spot is created via the hormones – estrogen to thicken the uterine lining (in the first half of the cycle) and progesterone to ripen that lining and make it ultimately inhabitable for a fertile egg. Both halves of the woman’s cycle need to be strong for this to occur and seed cycling helps to encourage that balance. 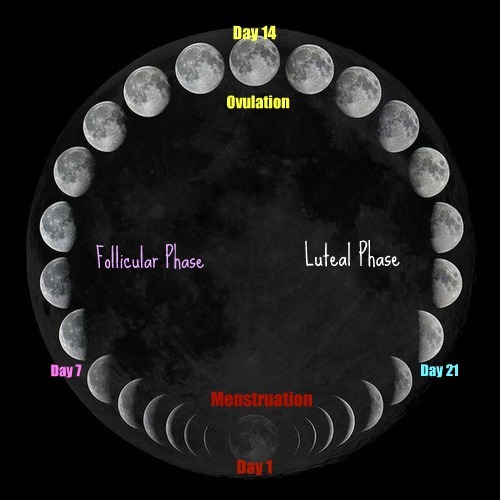 Days 1 (the first day of your period) through day 14 (when you ovulate) are called the follicular phase. They are building uterine lining and also ripening a strong egg. The flax and pumpkin seeds that you take during those days help to bring healthy estrogen levels while blocking conversion to unhelpful androgenic hormones like DHT. Day 14 and the window around that time (24-48 hours) is your fertile time – the time when you are most likely to conceive. Strong ovulations need a healthy estrogen spike nurtured by the hormone balance achieved in Days 1-14. 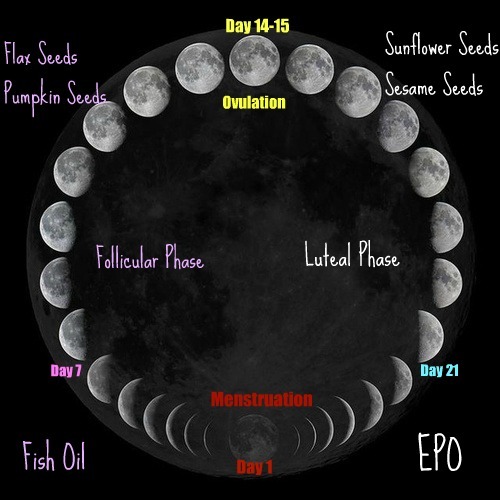 After ovulation through the rest of your cycle is called the luteal phase and is dominated by the hormone progesterone, which is encouraged by the combination of sunflower and sesame seeds. Progesterone is released by the pocket on the ovary out of which that month’s fertile egg came, called the corpus luteum. If the egg is successfully fertilized (meaning you get pregnant) then progesterone levels must stay elevated to help the egg to implant into the uterus and to prevent your body from flushing out the uterine lining (to prevent your next period). 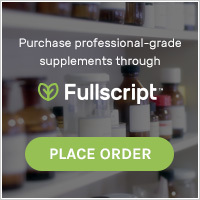 Encouraging good progesterone levels, is in fact one of the most important factors in keeping viable early pregnancies, especially in older women who are trying to get pregnant or women who have unbalanced hormone pictures that are shifted towards estrogen (like PCOS, endometriosis, and many cases of multiple pregnancy loss). Happily in the implanting days women who are seed cycling are already encouraging progesterone with the sunflower seed and sesame combination. 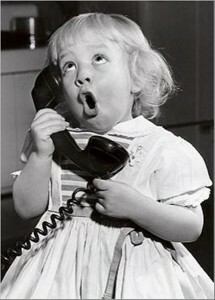 But what to do when you find out you are pregnant? That depends very much on you. Once women become pregnant seeds in your diet can still be highly supportive, but it helps to have some idea of your hormone balance before hand, and the “cycle” of menstruating is no longer happening. In fact, hormonally pregnancy becomes almost a hyper-extension of the luteal phase. As you can see, progesterone levels are on the rise through the entire pregnancy and logically to support that some women take the theory that they should continue the luteal phase seeds – sesame and sunflower. Others feel that all the seeds provide support and so choose to do steady amounts of all seeds on a consistent basis. *One good tip to remember* If you’re trying to get pregnancy it’s important to continue the luteal-phase seeds (sesame/sunflower) until you actually have a period, just in case you are pregnant that month. This gives the egg the best chance at implantation. This can be continued through the entire pregnancy as well as the early months of nursing (up to about 6 months post-partum). This seems to help many women soften the post-partum emotional changes that can occur because of the huge hormone nose-dive. After delivery some women have a hard time with the sharp drop of progesterone that happens along with the normalization of estrogen levels. Continuing the steady doses of seeds suggested in the pregnancy section can help to smooth out some of the rough edges, but there will come a time when your body moves more towards reestablishing it’s normal rhythm. Some women have a sense of this, whether it’s from changing nursing habits of their baby to hormonal symptoms like skin changes and some women really don’t feel it happening until they get their first cycle. If you start to feel changes then I typically suggest re-starting seed cycling then according to the lunar phase. If you don’t particularly feel anything then around 6-9 months or when your baby really starts to be interested in solid foods you can restart (also according to lunar phase). If your body surprises you with your first period out of the blue, then start seed cycling using day 1 of that cycle as your starting place. In every phase of pre-, during and post- pregnancy make sure that your maternity care team and doctors are aware of your seed cycling routine and that they don’t have any concerns for your particular pregnancy. Seed cycling and pregnancy is generally lovely, but may not be right for you so do check with your doctor. Also – here’s the moon phases, just in case you need those. This entry was posted in fertility, Hormones, Natural Cycles, Natural Health, Nutrition, PCOS, Women's Circle, Women's Hormones and tagged seed cycling and pregnancy, seed cycling for fertility, seed cycling for hormone balance on March 22, 2016 by amyneuzil. Seed cycling for hormone balance is one of those things that seems far too simple to ever work, but work it does! It’s very gentle nutritional support that encourages your cycle to follow it’s natural rhythm and gives the hormones gentle nudges in the right direction. Best of all, it’s done with whole foods, not with supplements or drugs, so it’s entirely natural, simple, inexpensive and gives you a whole different way to keep in contact with your body. Not only that, it can be helpful in situations that you might not think of right away – like for women post menopause, and for men looking to boost fertility. Yup, men. Seed cycling is a gentle way to help your body balance your hormones naturally by adding different seeds into your diet at different phases of your menstrual cycle. Simply adding seeds like flax, pumpkin, sunflower and sesame seeds to your diet at different times in your cycle can promote healthy hormones by encouraging your body to either produce or detoxify certain hormones. It is literally using foods to either promote estrogen detoxification, in the first half of your cycle, or to increase progesterone production in the second. Seed Cycling for Hormone Balance – What Does That Actually Help? Now – having said that, seed cycling for hormone balance is NOT a quick fix – you’re working to re-establish the rhythms of your body and that takes time. Typically you will start noticing changes after 3-4 months (3-4 cycles) but the great news is that because this is simply using foods it is safe to combine with other therapies and can help to enhance their actions. If you have one of the more serious hormonal issues like PCOS, then probably seed cycling isn’t going to fix it, but it can certainly help other measures to work better and help your body to find it’s rhythm. At heart, you are all wild animals. You love to pretend to be civilized and to wear a veneer of the tame, but truly and deeply your body belongs to the forest. In the “wild state” of being you wouldn’t have been exposed to artificial light and so very powerful signals were sent to your brain by the changing light of the moon, and this was one of the ways your body kept rhythms, including your hormone rhythms. Women’s typical hormone cycles are 28 days, which happens to be the length of a full lunar cycle as well (actually 28 and a fraction days). This is not a coincidence! You are designed to be at peak fertility, meaning ovulation, at the full moon (coincidentally when nights are brightest and you’re more likely to enjoy the sight of a partner). Fertility is lowest, meaning menstruation, at the new moon when nights are darkest. Men’s fertility follows women’s in this scenario so that we’re all most fertile at the same time – it works best that way for the baby-making. How Do I Seed Cycle? 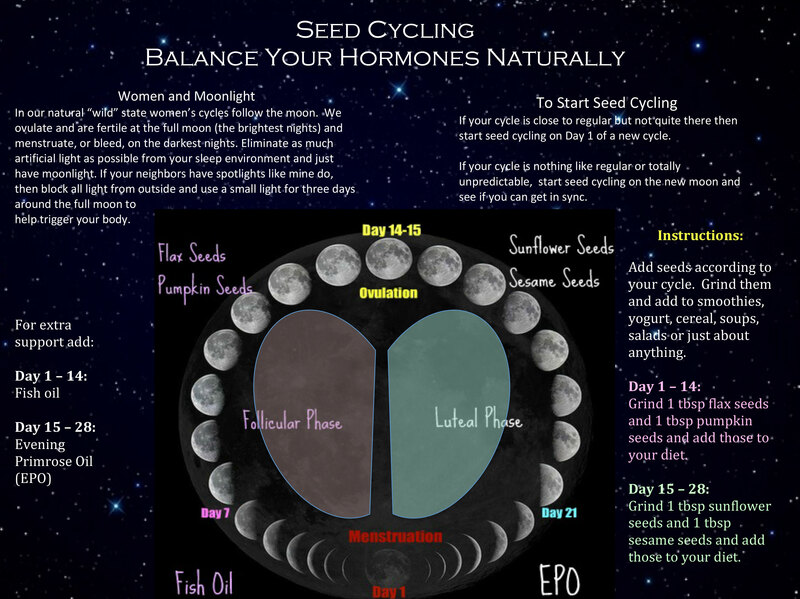 Seed Cycling for hormone balance adds seeds into your diet following the rhythm of your body or the moon. This is literally eating different seeds for different parts of your monthly rhythm because they help to restore your body to balance. You’ll recall that for women our hormones change in a predictable way with our cycle. Men have fewer hormone fluctuations through the month, but their peak fertility still should match with women’s – and everyone’s peak fertility is typically at the full moon (we are wild animals underneath it all). Eat your 2 tablespoons of mixed seeds every day according to your cycle. The seeds should be ground in a mortar and pestle, coffee grinder or vitamix and added to smoothies, soups, oatmeal, yogurt, cereal, salad or however else it’s easy to get them into you. Also of those four seeds try not to add them in other times as snacks because it makes things confusing- so snacking on sunflower seeds on your flax/pumpkin days is probably not going to help your body to find it’s rhythm. If you feel like you need a little extra push in the right direction, then you can also add supportive oils to this picture. Fish oil, about 1500 mg combined EPA and DHA can be added to Days 1 – 14 and Evening Primrose Oil (EPO) can be added to days 15 – 28. The pumpkin and flax seed combo is a potent one to help your body detoxify the extra estrogen that can plague this time of the month (the lignans especially from the flax seeds bind to excess estrogen and help your body to eliminate it) High zinc levels in pumpkin seeds prevent the estrogen from converting to harmful forms of testosterone and also prime your body for progesterone production which will happen in the second half of the cycle. The sunflower and sesame combo used in the luteal phase of the cycle has a much lighter dose of lignans from the sesame seeds, but is rich in zinc and selenium which helps progesterone production. These seeds are also a rich source of linoleic acid, an essential fatty acid which can convert to gamma linolenic acid, which also helps the balance between progesterone and estrogen. The seeds should be organic and raw if possible and ground fresh every day or two just because the oils in the seeds can go rancid if they’re ground for too long. You can add the seeds in anywhere that it’s easy for you and if you completely hate eating seeds you can mix them into a small glass of juice and gulp it down. The big picture of seed cycling for hormone balance. Because your cycle follows the moon. Also – if you don’t know the moon’s current phase, here’s that info. Thanks reader Zahra for reminding me that this isn’t here! This entry was posted in fertility, Hormones, Natural Cycles, Nutrition, Women's Hormones and tagged nutrition and hormones, seed cycling for fertility, seed cycling for hormone balance, seed cycling for hormones, seed cycling for men, seed cycling for PMS, seed cycling for post menopause on April 7, 2015 by amyneuzil.